Begin your copyright notice with the letter "c" in lower case. Enclose the letter in parentheses as follows: (c). Alternately, you can spell out the world "Copyright" or write the letter "c" with a circle around it. Put a blank space after the copyright symbol or word. Following the blank space, add the current year in numerals, such as "2012." Add a co-author's name in your copyright notice, if you collaborated on the work with another person. Your co-author's name should follow your name with the word “and” inserted in between. For example: "Richard Jones and Janice Smith." Append the words "All Rights Reserved" to the copyright notice, if desired. This phrase is no longer required by law and holds no legal weight, but it is still used in many modern copyright notices. Your copyright notice will read: (c) 2012 Richard Jones. All rights reserved. 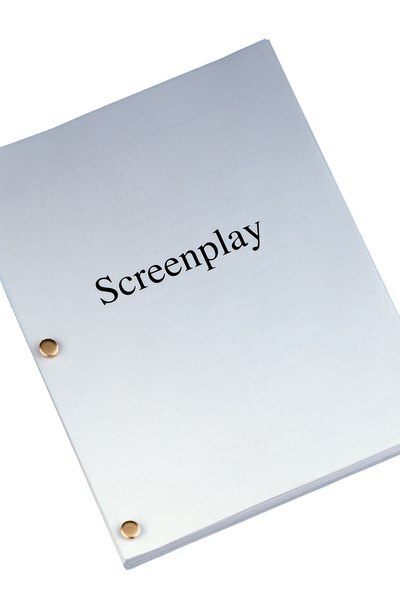 Place the copyright notice on your screenplay at the bottom of the title page. The notice may be placed in other locations within your script, but many sample screenplays show the preferred location of the copyright notice is the bottom of the title page. Iusmentis.com: The Phrase "All Rights Reserved"
Although your blog is protected by copyright the moment you publish it to the Web, you should consider registering your blog with the United States Copyright Office. Doing so will give you additional protection, including the right to sue and collect damages if someone infringes your content. You can copyright your entire blog as it exists on the date of registration, but subsequent updates will require additional filings. In addition to registering your copyright, placing a copyright notice on your blog will let visitors know that you are serious about protecting your rights. A copyright affords protection to creators and owners of unique intellectual property that is fixed in some permanent, tangible form such as a written notation, book, video, sound recording, or drawing. To be eligible for copyright protection, your choreography must be original. Under U.S. copyright law, as soon as an original work of authorship, such as choreography, has been created in fixed form, then copyright protection exists from that time. This gives the author or his agent to rightfully claim copyright. However, it is much better to register the copyright, because it creates a public notice that you own the rights and enables you to sue in federal court if someone uses your choreography without your permission. It is important to note that choreography that has not been made into a fixed form is not eligible for copyright protection. How Do I Apply for Copyrights in Nevada?